color=58&size=167&product_list_order=price - query parameters to filter by color and size attributes with specified options and apply price sorting for product list. 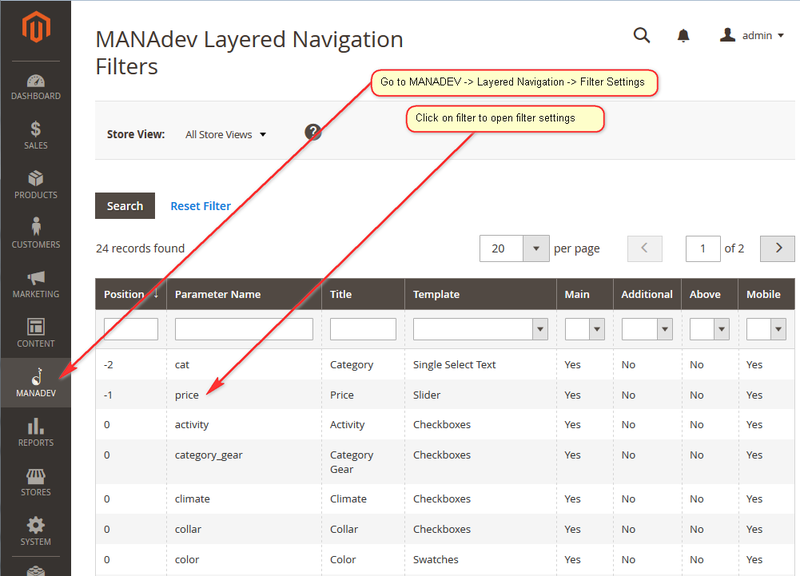 SEO Layered Navigation Plus for Magento 2 extension by MANAdev allows to move any or all parameters from query part into beginning or end of path part of URL. It is also possible to set parameter staying in query part of URL. Specific parameter order can be set for every URL part. Also, it is possible to customize URL key delimiters, setting up different delimiters for parameter values. And for specific parameters filter title can be skipped in order to have more elegant URL, but it should be done very carefully avoiding URL Key Conflict. How to recognize SEO URL key conflict? First sign in Magento 2, indicating, that URL key conflict exists for this filter or option, is error ERR_TOO_MANY_REDIRECTS when browser tries to open the page. Sometimes error is not shown, but the page cannot be displayed. Other possible behavior is that product list is filtered for only one of possible options, so result is unpredictable. By default spaces in URL are replaces with - sign. And also Option Delimiter in URL Path Prefix Delimiters or URL Path SuffixDelimiters is - sign. NOTE: It is not recommended to have different attributes of the same meaning for every attribute set, like 10 colors for every attribute set or 10 brands. Filter options in Layered Navigation depend on products in category (for better understanding how Layered Navigation works in Magento please read What is Layered Navigation in Magento 2 topic, so you will not get shoe brands in apparel category and vice versa. Quick search page is also more elegant with a single attribute for color or brand, allowing to filter products with one color filter instead of 10 color filters. If you really need more than one attribute with the same name in your store, make URL keys unique manually in MANAdev -> SEO Settings -> URL Keys. alternatively, consider changing space symbol with + sign or some other in Symbol Translations in URL Keys section (by default is is replaced with - sign). It is convenient to start configuration from general SEO settings and default SEO settings applicable to all filters. It can be done in Global Configuration menu under SEO Settings section. Later on you can customize certain SEO settings for each filter. Individual filter configuration can be adjusted in Filter Settings menu. Also generated URL keys can be checked and fine tuned in URL Keys menu. Section defines common parameters and default SEO configuration for certain types of layered navigation filters. 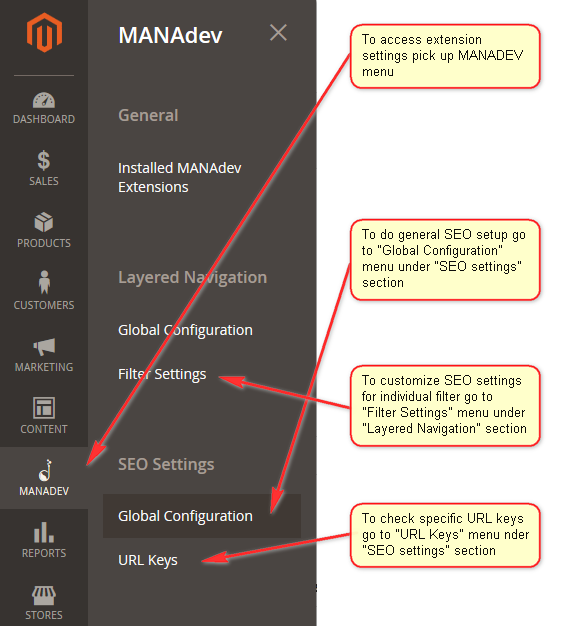 To do this navigate to MANADEV -> SEO Settings -> Global Configuration menu. Search Page - key to identify search results in URL. Default value is search. In this case when customer types red jacket in search field, result page URL would look like domain.com/search/red+jacket. Symbol Translations - list of symbols will be used to replace one symbol with its substitutions. Every value should be set as a pair of symbol and its substitution: "<original symbol>":"<symbol(s) to be substituted with>". If you want to remove specific symbol from URL at all, you can leave <symbol(s) to be substituted with> field empty. Also, you can substitute one symbol to several characters. Some restrictions on symbols that is used in URL exists. For instance some of specific symbols are reserved for other purposes (";" , "/" , "?" , ":" , "@" , "&" , "=" , "+" , "$" , ","), some are incorrectly interpreted by search engines ("_"). Another useful application of this feature is to convert national characters to Latin in URL. Let's say you can easily substitute German symbol "ä" (a-umlaut) with "ae" Another case when substitution can be used is when you need replace all local non-Latin characters with Latin letters in URL. You can enter substitutions for the whole alphabet. some HTML special like ¼ (one quarter) characters does not looks nice in URL. Store level configuration to define URL delimiters between different parts of URL path. In case default value is changed, redirect for old value is created. It will help to avoid 404 Page not found error if visitor clicks on old link. It also helps to move search engine ranks from old to new URLs. Later on redirect can be deleted. It can be done in Show redirects dialog below changed value. Category Path Delimiter - symbol to divide category levels in URL. For example when / symbol is used as a value for the parameter, URL for Jacket third level category would look like domain.com/women/tops-women/jackets-women.html. Store level configuration to define <URL path prefix> part delimiters. In case default value is changed, redirect for old value is created. It will help to avoid 404 Page not found error if visitor clicks on old link. Later on redirect can be deleted. It can be done in Show redirects dialog below changed value. 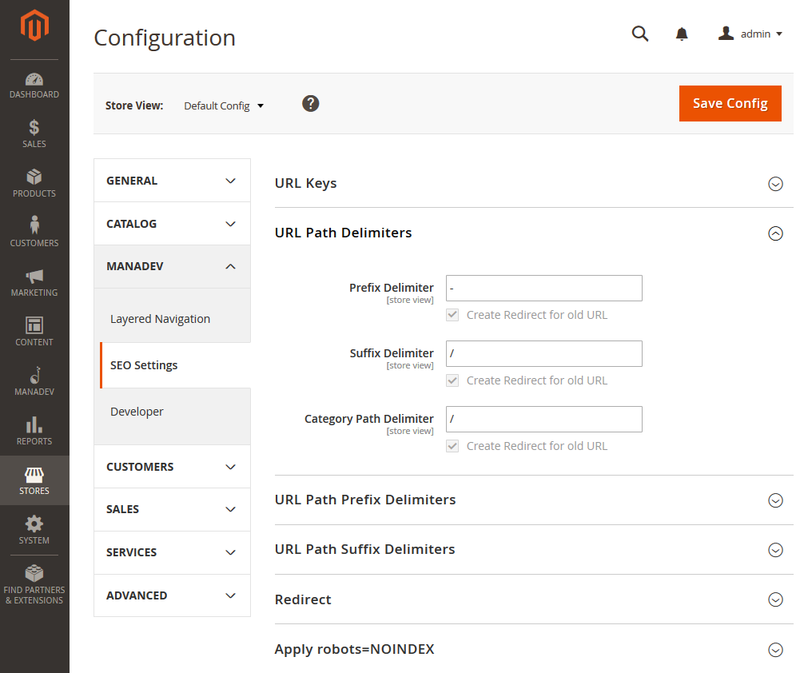 Store level configuration to define <URL path suffix> part delimiters. Global parameters which help search engine in some specific cases. Query Parameters to Path Parameters - if set to Yes creates redirects for old URLs when non SEO Magento store was live for some time. Non SEO URLs to Their SEO Counterparts - creates redirect for Magento non SEO URLs to SEO friendly URL keys in case parameter is set to Yes. In original Magento one page can be accessed using 2 different URLs. For example Jacket category can be accessed by well known domain.com/women/tops-women/jackets-women.html URL and by specific domain.com/catalog/category/view/id/23. This is called Duplicate content issue that reduces page ranking and put page lower in search results. Extension will automatically redirect catalog/category/view and catalogsearch/result URLs to URLs based on SEO friendly URL keys. Applied Category Filter to Subcategory Page - Yes is recommended. By default Magento category filter just do the filtering of the same page. Here is very thin and hardly understandable by many people difference between category page, filtered by subcategory, and subcategory page itself. For example, if in Electronics category we are filtering by Computers, we in fact are filtering Electronics page by Computers filter, which is not the same as Computers subcategory page. Although, those two pages have the same set of products, we are facing duplicate content issue problem when two different URLs shows the same content. To Correct Path Parameter Order - in case of Yes creates redirects for old URLs with different parameter order. This is useful if store is launched some time ago and now parameter sort order was changed. In case to save ranking, set this parameter to Yes. Home CMS Page to Home Page - if set to Yes redirect will be created for CMS page to store home page. CMS page which is set as 'Home pagecan be accessed by using 2 different URLs:domain.comanddomain.com/home. To avoid **duplicate content issue** extension will redirect second URLs todomain.com`. If Number of Applied Filters Is Equal or More Than - If value is not empty then NOINDEX tag will be set for pages when number of applied filters is equal or greater than parameter value. Leave field empty to disable this setting. Count Applied Options in the Same Filter As One. Supporting parameter for value defined above. If Yes - options of the same filter considers to be counted once. For example if Red and Yellow options of Color filter are selected, it will be counted as one applied filter in case Yes is selected or as two different filters in case of No. NOTE: NOINDEX tag behavior also can be modified if any or specific filter is applied or product list toolbar parameter is set. It is described below under Force NOINDEX If Parameter is Present in appropriate section. Add NOFOLLOW to Layered Navigation Links - general setting to put rel="nofollow" attribute to every link on layered navigation if conditions for succeeding parameters are met. If Number of Applied Filters Is Equal or More Than - If value is not empty then NOFOLLOW tag will be set for pages when number of applied filters is equal or greater than parameter value. Leave field empty to disable this setting. Count Applied Options in the Same Filter As One - Supporting parameter for value defined above. If Yes - options of the same filter considers to be counted once. NOTE: NOFOLLOW tag behavior also can be modified if any or specific filter is applied or product list toolbar parameter is set. It is described below under Force NOFOLLOW If Parameter is Present in appropriate section. Duplicate content issues occur when the same content is accessible from multiple URLs. Canonical URLs are used to prevent this and improve page ranking for a content available through multiple URL. For example let's say same women jacket product list can be accessed by domain.com/women/tops-women/jackets-women.html URL and domain.com/women/tops-women/style-jackets.html. We want only first of these URLs which indicate subcategory page be used by search engines. Preferred same canonical URL <link rel="canonical" href="domain.com/women/tops-women/jackets-women.html" />should be defined for the pages with equivalent content. In this case it will accumulate all ranking and will be used to navigate customer to a page. Points to Page With All Products. You can refer to Google best practice View-all in search results, to make your choice, while our recommendation is Yes if category page contains reasonable amount of products. In this case canonical URL will point to view-all page, where all filter results are listed in one page without pagination. Otherwise, search results will be divided into page and first page will be used as canonical URL. NOTE: Canonical setting can be override if any or specific filter is applied or product list toolbar parameter is set. It is described below under Include in Canonical URL parameter in appropriate section. Magento generates URL parameter for product list pagination in <query parameter> part of URL in case all products cannot be shown on one page and customer scrolls past the first page. Extension can set up this part to be more understandable for human beings. For example, you can see p=2 in non-SEO URL, but extension can convert it to page-2 or your proposed page keyword and move it from <query parameter> to <URL path prefix> or <URL path suffix> . URL Key - key to identify the page of product list in URL in case customer scrolls past the first page. Default value is page. In case customer goes to second page in Jacket third level category, result page URL would look like domain.com/women/tops-women/jackets-women/page-2.html. Local translation or other keyword can be used. Position in URL - number which defines the order between other parameters in same <URL part>. Smallest number moves parameters to the left which has more weight for search engines. Include in Meta Title - Proposed value is Yes. In this case page identification will appear in page meta title tag. Meta title will be used as page title in search result provided by search engine, and will appear on browser's tab caption when customer will open it. For example Jackets - Tops - Women (Page 2) page meta title will be set in case Jacket subcategory second page is selected. Include in Meta Description - Proposed value is `Yes'. In this case page identification will be added to page meta description. Meta description is shown below page title in search result list. User can change default product list sort order by selecting different option in 'Sort By' dropdown. Original Magento show sorting in query part in URL as ?product_list_order= parameter. Our extension allows to name sort key properly and place it before or after URL path or keep in query part. URL Key - key to identify sorting parameter in URL. Proposed value is sort-by. Local translation or other keyword can be used. Additionally Allowed Options - comma-separated list of additional sorting options. See explanation of Allow Only Known Options parameter above. Include in Meta Title - Proposed value is No. In case of Yes value sorting identification will appear in page meta title tag. Meta title will be used as page title in search result provided by search engine, and will appear on browser's tab caption when customer will open it. Include in Meta Description - Proposed value is No. In case of Yes value sorting identification will be added to page meta description. Meta description is shown below page title in search result list. User can change sort order direction by setting descending or ascending option. In case product list is sorted in ascending order, URL does not change. When descending order is selected, original Magento adds &product_list_dir=desc parameter into query part of URL. Our extension allows to name sort direction key properly and place it before or after URL path or keep in query part. URL Key - key to identify sorting direction parameter in URL. Proposed value is sort-direction. Local translation or other keyword can be used. Include in Meta Title - Proposed value is No. In case of Yes value sorting direction will appear in page meta title tag. Meta title will be used as page title in search result provided by search engine, and will appear on browser's tab caption when customer will open it. Include in Meta Description - Proposed value is No. In case of Yes value sorting direction will be added to page meta description. Meta description is shown below page title in search result list. Originally product list in many templates is shown as a grid of products. There is also an option to show products in a list. In custom Magento templates or themes additional modes can be used. If user chooses not default product list mode, it will appear in page URL. Default Magento URL will have &product_list_mode= parameter in query part of URL. Our extension allows to name mode key properly and place it before or after URL path or keep in query part. URL Key - key to identify product list mode parameter in URL. Proposed value is mode. Local translation or other keyword can be used. Include in Meta Title - Proposed value is No. In case of Yes value mode will appear in page meta title tag. Meta title will be used as page title in search result provided by search engine, and will appear on browser's tab caption when customer will open it. Include in Meta Description - Proposed value is No. In case of Yes value mode will be added to page meta description. Meta description is shown below page title in search result list. Standard Magento theme provides possibility to select a number of product per page. 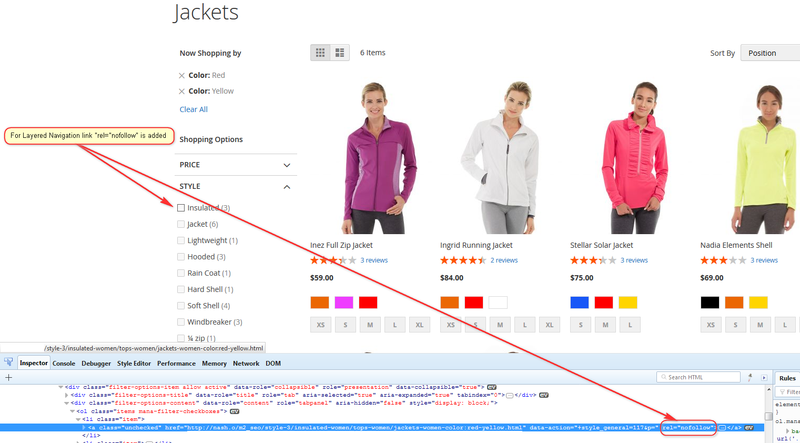 If store user changes it, original Magento adds &product_list_limit= parameter to query part of URL. Our extension allows to name this key properly and change the place of this parameter in URL. URL Key - key to identify product list mode parameter in URL. Proposed value is show-per-page. Local translation or other keyword can be used. Include in Meta Title - Proposed value is No. In case of Yes and custom number of products per page is set, it will appear in page meta title tag. Meta title will be used as page title in search result provided by search engine, and will appear on browser's tab caption when customer will open it. Include in Meta Description - Proposed value is No. In case of Yes and custom number of products per page is set, it will be added to page meta description. Meta description is shown below page title in search result list. Extension let to change the place of search keywords in URL. Include in Canonical URL. Yes is recommended which will add search parameter to canonical URL. If value is No canonical URL will point to the first page of product list or page with all products as specified in Canonical URL section. Include in Meta Title - Proposed value is Yes. In this case search keywords will appear in page meta title tag. Meta title will be used as page title in search result provided by search engine, and will appear on browser's tab caption when customer will open it. Include in Meta Description - Proposed value is `Yes'. In this case search keywords will be added to page meta description. Meta description is shown below page title in search result list. Several filter specific parameters for SEO are stored on filter level. This section stores default values for filter SEO configuration. Include in Canonical URL . Yes is recommended which will add filter parameter to canonical URL. If value is No canonical URL will point to the first page of product list or page with all products as specified in Canonical URL section. Include in Meta Title - Proposed value is Yes. In this case filter will appear in page meta title tag. Meta title will be used as page title in search result provided by search engine, and will appear on browser's tab caption when customer will open it. Include in Meta Description - Proposed value is `Yes'. In this case filter will be added to page meta description. Meta description is shown below page title in search result list. Excluded Query Parameters - comma-separated query parameters. If set, they are excluded from all layered navigation links. Useful for marketing campaign tracking parameters like utm_campaign. This section describes how specific filter will affect URL and page meta infromation if it is applied. All generated URL keys can be checked and fine tuned in URL Keys menu. To do this navigate to MANADEV -> SEO Settings -> URL Keys menu. Specific URL key can be opened by clicking any row field. Here you can find an information how and why this URL key was generated and what is the status of this URL key. Assigned URL Key - use this field to override inferred URL key. Leave empty to use inferred URL key. Whitespace in URL key is not allowed and is trimmed. There are 3 templates which can be used to customize page meta tags. They are located in app\code\Manadev\LayeredNavigationSeo\view\frontend\templates\ folder. meta_title.phtml - how the meta title tag should be presented. Meta title will be used as page title in search result provided by search engine, and will appear on browser's tab caption when customer will open it. meta_description.phtml - what should be included into page meta description. Meta description is shown below page title in search result list. $filters - a set of applied filters. This array is collected based on each filter setting used for specific meta tag. For instance, in case of meta_title.phtml only filters with Include in Meta Title = Yes are included. In order to do customization you need to copy template text to appropriate place it your theme and modify PHP source code using variables above.